Internet is flooded with enterprises trying to sell their products and services. The clutter leaves almost no space for new startups to be visible to their potential customers. Internet giants are commanding the audience with their customizable services and affordable products. Startups and newbies to digital marketing find it difficult to make their presence felt if they try to promote their business using traditional mediums or be their own digital marketers. To be successful they must show belief in Digital Marketing Agencies. It is possible to command traffic and create brand hype only by taming search engines, social media platforms and forums. A lot of entrepreneurs underestimate the power of social media marketing in the modern world but if done professionally it can do wonders for their business. To beat the competition in style: Let’s agree to the fact that beating Flipkart and Amazon will require billions of dollars. Hence begin by beating next door competitors, with innovative digital marketing strategies. Entrepreneurs can create awareness about their brand on Internet and beat the competition. Search engine ranking: A professional digital marketing company can help you rule the first few pages of search results in popular search engines like Google and Yahoo. With a professional agency, taming search engines gets easier. Mastering the search engine rankings can get your business reputation like no other form. 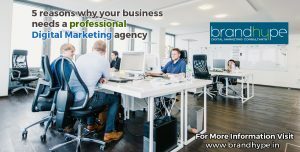 Professional digital marketing agencies like Brandhype in Delhi work really hard to help businesses acquire the best of ranking and online reputation. Customized packages: When you hire a freelance search engine optimizer or digital marketer he may charge you a less, but a professional digital marketing agency will offer you packages that are customized specifically for you. With these customized packages you will be able to acquire the requisite results without spending a fortune. Digital marketing agencies are always up-to-date about the recent trends and algorithm changes. Hence with them you can acquire results that will astonish your competitors. With professional digital marketing agency you can expect results, results that can make or break your online business. Automated growth: A professional digital marketing agency that serves you through packages will put the growth of your startup or established business on automatic mode. They are not worried about income flow every month like most freelancers hence they are going to ensure that the company grows on its own after a particular period of time. These agencies are catering to various enterprises at the same time hence they know what to do, how to do and when to do it. Outreach: Social media marketing agencies have a control over social media and search engines. They are aware of sites performing well. Hence they can use the traffic from those sites to make get you desired hit. They can always run campaigns that benefit your site without costing a lot. There are many reputed digital marketing companies in India, which help enterprises to build a brand that caters to masses. Brandhype.in is amongst one of the best digital marketing agencies in India. It is important for a business to hire an agency which understands their objectives and designs a campaign that can meet these objectives at affordable cost.